Without the support of Outset and Live West I don’t think I would have been able to start my own business. Drive and motivation are two desirable attributes that a person needs for their business to succeed. 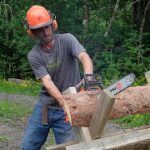 Daniel Godliman has both of these, and with support from Outset Cornwall, Live West, Penryn Job Centre and the NEA scheme, Daniel is pushing his business DG Firewood to new heights. Daniel had been classed as long-term unemployed due to two battles with cancer. He felt that gaining employment would be difficult for him due to the length of time he had been out of the workplace. After being out of the workplace for a long time, Daniel’s confidence was low. However, after attending the workshops and meeting others that were all starting out with a variety of ideas and differing backgrounds, his self-belief grew, and he was able to reach his goals. Outset Cornwall provided Daniel with intensive business support, allowing him to explore the possibilities of self-employment. Working through the Outset programme allowed him to progress from the idea stage to a fully-fledged business in a few months. Outset assisted him with planning, pricing and logistics, enabling him to become eligible for New Enterprise Allowance support. Daniel was able to start supplying local business with logs. However, as he began to increase his customer base, it quickly became apparent that splitting logs by hand and using a chainsaw was unsustainable. This process was slow and dangerous and was preventing the business from growing. With Outset’s assistance Daniel redrafted his business plan, using up to date figures and findings and identified that he would be able to increase output by 400% with the purchase of a hydraulic log splitter. Outset teamed up with Live West and, using a combination of Outset’s microgrant and Live West’s tenant bursary, provided a joint grant to purchase the much-needed log splitter. “Without the support of Outset and Live West I don’t think I would have been able to start my own business” shared Daniel.